Plants are capable of producing a range of hormones. Some are synergic and amplify each other's’ effects. Others are antagonistic and oppose each other's’ effects. There are many kinds. 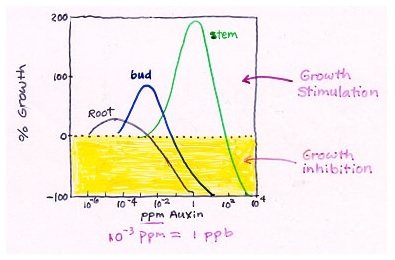 In flowering plants, hormones are made in some regions of the plant that may be different to where they act to initiate a response to stimuli. Be clear about the exact roles of the key plant hormones. For example, auxins cause cell elongation - not cell division. Ie, the number of cells remains the same.